These two quotes from Fun Home perfectly describe my frustration with Bechdel’s obsession with using psychoanalysis and countless dry quotes in academic-speak to not only figure out her feelings for her mother, but to decipher her sense of self. I began to lose patience for her long neurotic struggle which saw me condemn her many times for tedious self-absorption despite obviously low self-esteem and self-hatred and a feeling of being unworthy of love, affection and praise. Self awareness may be important for personal growth but you also have to look outside yourself in order to understand who you are and who you want to be in the future. While bits of the psychoanalysis are spot on, things like poking yourself in the eye is just an accident, nothing more. ‘Psychoanalytic insight, [Alice] Miller seems to suggest, is itself a pathological symptom.’ I’d agree. Bechdel drives herself crazy trying to find meaning in every little detail. This only lets up towards the end when Bechdel falls back to the insertions of literary criticism reminiscent of Fun Home. Psychoanalyst Donald Winnicott appears to be Bechdel’s hero when it came to the mother-child attachment, so much so that her cat is named Donald. He’s heavily quoted throughout and is depicted as a nice man who was amazing with children though he had none of his own. Winnicott’s ideology frames Bechdel’s insights and belief’s into her maternal bond, although they didn’t always feel relevant compared to the significant results of simply recollecting and interrogating the past in a basic fashion. 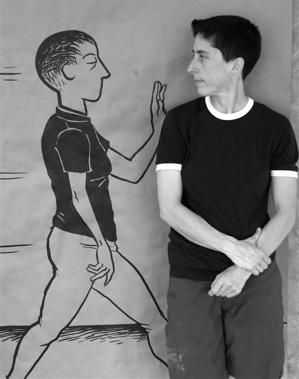 On memoir writers divulging the personal information of others without permission Bechdel writes, “Well . . . writers are kind of monstrous, aren’t they? They don’t have, like, normal human ethics.” She herself transcribed conversations with her mother. By writing about her dysfunctional parents in order to understand them, Alison severely damaged her prospects of forming the type of relationship she wanted with her mother. A sad irony. Alison uses her beloved therapist Jocelyn as a surrogate mother figure to absorb the good feelings Jocelyn had about her. ‘Mom and I didn’t hug or kiss goodbye. We hadn’t touched in years.’ It’s telling that one hug from Jocelyn and calling Alison ‘adorable’ seemed to do more for Alison than the psychoanalysis. Jocelyn’s comment, “I think your mother has some resentment about being female that got passed on to you” has some merit. Bechdel’s father preferred Alison to look like a stereotypical girl, to wear dresses, have ribbons in her hair, etc. Alison rejected this aesthetic instead going for the tomboy image instead. Her mother being seen to prefer her brothers over her probably reinforced the idea that anything “girly” was bad. Virginia Woolf’s influence in having said writing about her mother in To The Lighthouse helped put her obsession with her to bed, Bechdel declares writing Are You My Mother? she was able to do the same. Want to know the possible roots of misogyny? Bechdel seems to suggest that womb envy may be one and there’s also an implication of resentment towards women for the dependence we all had on them as children. Poet and radical lesbian feminist Adrienne Rich is another of Bechdel’s heroes. ‘The essay in which [Adrienne] Rich cites A Room of One’s Own covers some of the same ground as Woolf’s Book. Like, for example, the woman writer’s peculiar challenge to cease being an object and start being a subject.’ As a fellow feminist this makes me want to read Woolf and Rich. In her struggles to write her memoirs Bechdel came across Freud’s inclusion of an interesting quote on writer’s block from poet Frederick Schiller. Reading Are You My Mother? wasn’t as an enjoyable experience as Fun Home despite being familiar with psychoanalytical theory. As a theme, it’s overused and monotonous and certainly reduces the book’s appeal to a wider audience, even fans of Fun Home. Prolonged angst over anxiety, depression and writer’s block made it difficult to sympathise with Alison despite experiencing those issues for myself and recognising the symptoms. Although one moment of shared history did tickle me. ‘I found I could soothe myself to sleep with a fantasy.’ I wonder if other writers and bibliophiles did this as children, too. As for the drawings, there’s a change from Fun Home‘s blue-tinged imagery to maroon. I’m unsure if Bechdel did this intentionally to represent the stereotypical colours corresponding to the gender of the parent she’s analysing. In any case, the warmer colour is easier on the eye.